If you are looking for information on the Planet Beach franchise business opportunity, Planet Beach franchises or Planet Beach franchising, then you have come to the right place. Developed by Planet Beach, a contempo spa is an environment that allows customers to experience tanning and spa quality treatments in their own private room without the need of an attendant. At the push of a button, our customers enjoy a relaxing and soothing contempo spa experience that hydrates skin, rejuvenates cells and invigorates the mind and body - providing the ultimate in skincare solutions. Planet Beach is committed to remaining ahead of the curve within the tanning and spa categories of the skin beauty and wellness industries. With our progressive take on the neighborhood contempo spa concept, we offer our customers the unique opportunity to experience beautiful, glowing skin and a relaxed mind and body, in an alternative environment. From franchising single or multi-unit locations to overseeing a specific territory as an Area Representative, and even expanding internationally, Planet Beach has several viable business opportunities available. We invite you to join our success! Escape from the everyday life. Indulge in treatments that soothe the soul, relax the mind and revitalize the body. Take on a healthy, refreshed glow as your entire body approaches new horizons in health and beauty. Planet Beach, Our Solar System Revolves Around You! At Planet Beach, we help you to look good and feel even better! The Best Tanning. The Ultimate Skincare. We invite you to join Planet Beach, the innovator of the neighborhood contempo spa concept, a booming billion dollar industry! Planet Beach has put in the hard work, done the preparation, and learned what it takes to be successful and the most respected brand in skin wellness and tanning services. Planet Beach Contempo Spas provide the ultimate skincare solution for customers in a non-invasive boutique environment. Our contempo spa services are exclusively available at Planet Beach locations and cannot be found anywhere else! An exciting company with a determined spirit and firm focus, we welcome you to indulge yourself with the possibility of being a part of the Planet Beach system, and envision a partnership where you are supported by a franchising company that sets the bar for the industry. With Hundreds of Locations Worldwide, Planet Beach is the world's largest and fastest growing neighborhood Contempo Spa franchise. A Franchising Corporation that stands on its own accomplishments and is the innovator and leader in the tanning spa industry, Planet Beach welcomes you to explore your curiosity and discover why Planet Beach has been rated, time and time again, the # 1 contempo spa franchise in the industry. By the end of 2008, Planet Beach will strive to have open or under development at least 1000 locations, including many locations in other countries through our International Expansion Program. We also offer franchisees the right to purchase and develop territories through our Area Representative program. Planet Beach currently has over 600 awarded locations in the US, Canada and Australia. In 2005, Entrepreneur Magazine has ranked Planet Beach #91 in the Franchise 500, #1 in the tanning salon category, #52 as the fastest growing franchise, and #74 worldwide. Buying a business is a big step, and we want to make sure we are facilitating all of your needs. In order to show you a glimpse of our proven success and substantiate our concept, we welcome you to enjoy "The Planet Beach Experience." A Franchising Corporation that stands on its own accomplishments and has become a leader in the tanning industry, Planet Beach welcomes you to explore your curiosity and discover why Planet Beach has been rated, time and time again, the #1 Tanning Salon Franchise. Planet Beach Franchising Corporation began with one salon in New Orleans in April of 1995. In 1996 the company began selling franchises and in October of that year the first franchise location opened in Atlanta, GA. 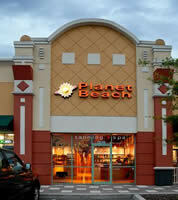 Planet Beach has grown and is now the largest and fastest growing contempo spaTM Franchise in the world. We are the leaders in the contempo spaTM industry and are honored with yearly rankings in nationally recognized publications such as Entrepreneur and Success Magazines.